Get Your Gutters Winter Ready. There’s Still Time! If you didn’t do your Fall gutter cleaning, you may be dealing with the unfortunate side effects right now. This is a much bigger problem than you might think. Read below for a run-down on the potential problems and get a few easy solutions. 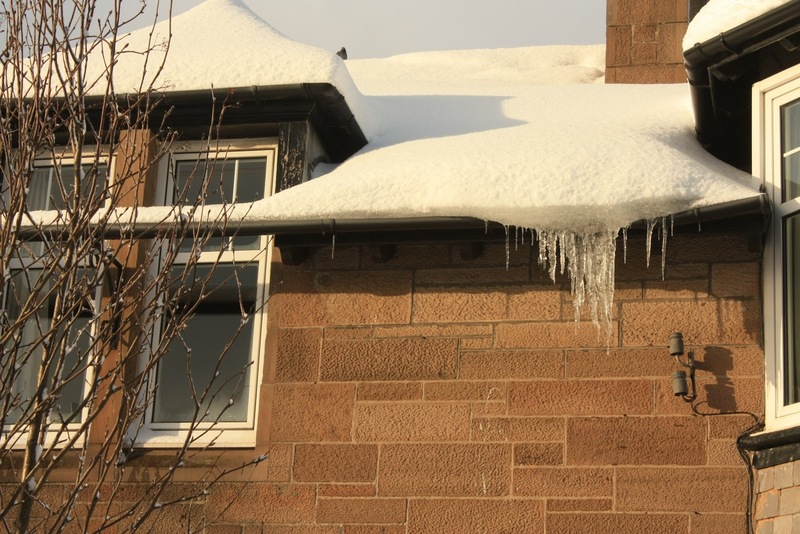 As water freezes and expands in your gutters, it can cause gaps in the seams that connect long lengths of gutter. Small, steady leaks will go on all season long whenever ice melts. The added weight of ice-filled gutters can also cause them to pull away from the house and leak directly onto your fascia board and siding as water flows over the ice-clogged gutters like a waterfall. These leaks are especially bad for your home since they’re positioned perfectly to rot wooden trim, damage siding and cause pools of water around your foundation. This water often leads to basement leaks and foundation damage when it freezes and expands in small cracks. Backed up gutters can be bad for your roof as well. As snow accumulates on top of the frozen-over gutters, it compromises the edges of your roof by pushing its way under the shingles as it melts and refreezes. The effect is almost like a crow bar prying the shingles up. Many wood-eating insects favor damp wood, so rotted fascia boards under your gutters will invite them into your home. There are also the obvious potential slipping hazards when water isn’t controlled by the gutters and downspouts and freezes on your sidewalks and driveway instead. This is a serious liability issue for a homeowner and also a painful, embarrassing way to learn your lesson if you slip and injure yourself. You may think that you’re stuck with leaking gutters until Spring, but it’s still possible to clear them out. A warm week like the one we’re having right now is the perfect opportunity, so don’t wait to take care of this potentially expensive problem. The solutions are all easy and inexpensive! If your downspouts seem hopelessly clogged, you don’t need to break out a whole gutter cleaning kit to fix it. Simply purchase a hose extension to power wash them out. This one from Lowes telescopes to reach without a ladder and curves perfectly for angling into your gutters. Your leaf blower can also clear out gutters and downspouts. You might want to wear goggles for this in case filth and debris blows back at you. If ice has really clogged things up, try to gently loosen the edge of the ice and slip something long and flat like a yardstick under it as much as you can. This creates a channel that you can pour hot water down. Work your way towards the downspout and ice will come up in large blocks. All of the above fixes require tools and, sometimes, ladders. If you have any doubts about your ability to handle it yourself, hire a professional. Many gutter companies are still working in the Winter when weather permits. If you’d like recommendations, feel free to call me at (973) 335-4600.